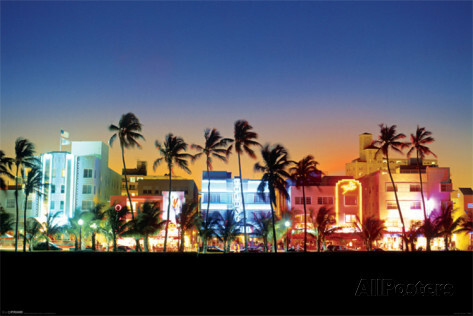 Miami Florida Travel Posters and Prints at Ace's Web World. Available on this page are these Miami, Florida posters and prints: South Beach, Florida; Miami Beach, Palms & Sunshine; Miami, Florida; Miami Beach; Miami - Jerry Driendl, Lincoln Road, Miami - The Magic City; Miami, By the Sea; View of South Beach at Night - Terry Why; Miami Beach - Kerne Erickson; Miami Day; Twilight View of the Miami Skyline - Richard Nowitz; Hialeah Race Track; Miami Skyline, FL - Cheyenne Rouse; Greetings from Miami; Miami Beach I - Robert Leyton; Miami, Florida - Mike Smith; and more. There are two more pages dedicated exclusively to Vintage Florida Posters.